So October 2 has come and gone. We duly remembered Mahatma Gandhi on his birthday, and went about our usual business. A few people also speak about cleanliness in our public spaces, since it is also “Swacch Bharat” Day. 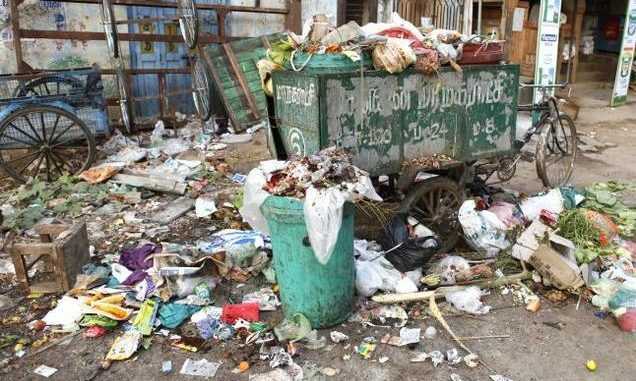 From this day, source segregation of waste will be mandatory in Chennai – the city that generates the largest per capita amount of garbage in the country. 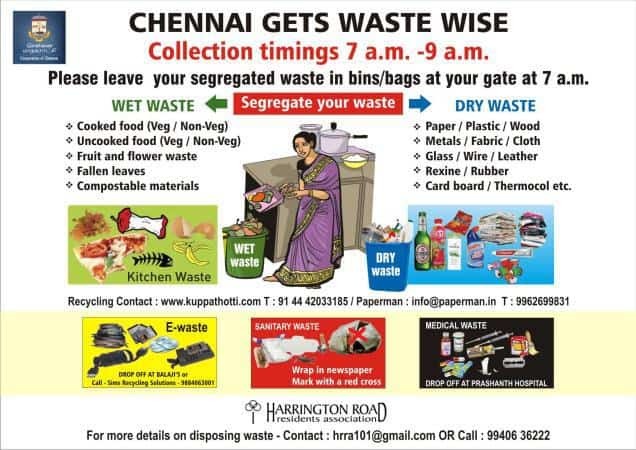 The Greater Chennai Corporation has been reaching out to all the different categories of waste generators – residential, commercial and industrial- with suggestions, recommendations and guidelines. It is no doubt a great start, but much more needs to be done towards awareness and enforcement. A publicity blitz, as it were, is the need of the hour. While we wait for that, here is a short note that I wish someone has shared with me, when I first started to segregate waste at home. Segregation of waste at home is really very simple, something our grandparents did intuitively because recycling made economic sense. it still does, but somehow we have lost sight of it in the recent past. Let us try and get back to the basics. What do we mean by waste segregation? Waste segregation basically means keeping wet and dry wastes separately, so that dry can be recycled and wet waste can be composted. How do I practice waste management at home? Send wet waste out of the home daily. Store and send dry waste out of the home, once a week. Wet waste consists of kitchen waste – including vegetable and fruit peels and pieces, tea leaves, coffee grounds, eggshells, bones and entrails, fish scales, as well as cooked food (both veg and non-veg). Often it is possible to compost the wet waste at home, but if that is not an option, it can be given away on a daily basis to the waste collectors who come for door to door collection. This includes used menstrual clothes, sanitary napkins, disposable diapers, bandages, human hair and any material that is contaminated with blood or other body fluids. Paper, plastics, metal, glass, rubber, thermocol, Styrofoam, fabric, leather, rexine, wood – anything that can be kept for an extended period without decomposing. What is the best method of storing dry waste? Store it in a bag in the utility area after cleaning and drying till it is picked up. There are several agencies in Chennai who are now in the business of recycling dry waste – kuppathotti.com, trashgaadi.com, earthrecycler.in, paperman.in, to name a few. E-waste or electronic waste consists of batteries, computer parts, wires, electrical equipment of any kind, electrical and electronic toys, remotes, watches, cellphones, as well as bulbs, tubelights and CFLs. Store them in separate container which is kept closed, away from moisture and in which nothing else is put. Sanitary waste. Wrap in a newspaper, mark with a red cross, and give everyday to the GCC. HHW or household hazardous waste includes, apart from E-waste and sanitary waste, toxic substances such as paints, cleaning agents, solvents, insecticides and their containers. These must be disposed of separately through the recyclers. Chennai is still a green city, and a large portion of our garbage is green. Garden waste, if in small quantities, can be composted. Large quantities, branches of trees etc, will have to be taken away with prior agreement, by the GCC vehicles. Explain waste segregation to your family / neighbours in your apartment building. Get separate storage drums for storing the dry waste and wet waste. This note draws liberally from the great spread of resources on www.2bin1bag.in. I encourage you to visit this site – there are guidelines, FAQs, explainers, for every category of waste generator. Please visit, and use the information to reuse, recycle and reduce the amount of waste going to our landfills. Chennai Buzz : Worry over monsoon readiness, first future-ready street, cyber crime and more! 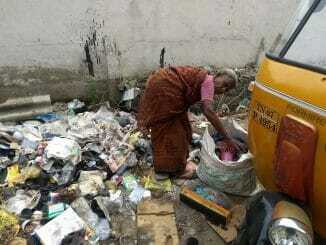 Chennai’s ranking in this year’s Swacch Survekshan is a dismal 235 out of 434. 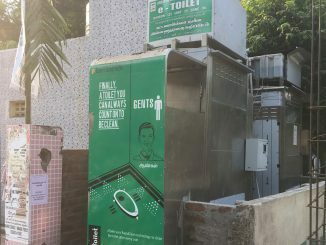 For the city to literally ‘clean up’ its act, there has to be a concerted effort to build more toilets, encourage their use and stop open defecation.